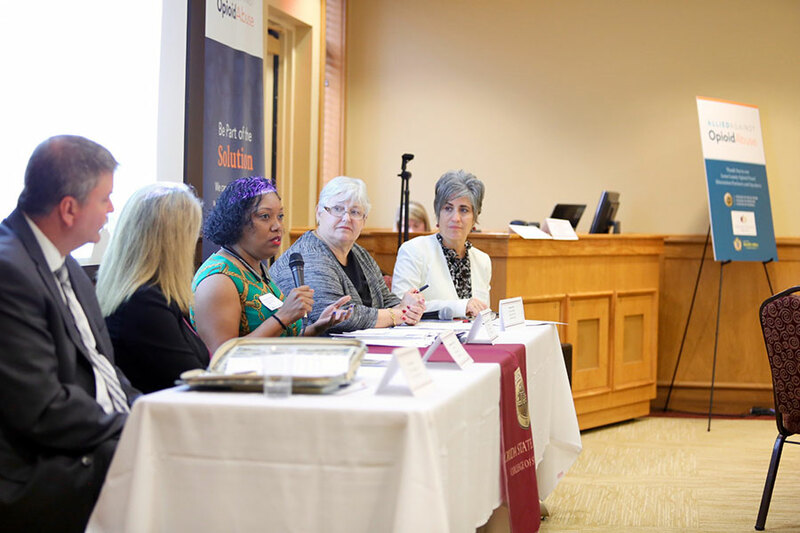 Eugenia Millender, an associate professor in the FSU College of Nursing, addresses attendees during an opioid abuse prevention panel discussion on May 18. Three FSU colleges — Social Work, Medicine and Nursing — partnered with Allied Against Opioid Abuse to host the event. Drug overdose is the leading cause of accidental death in the United States according to a recent report by the Trust for America’s Health and the Robert Wood Johnson Foundation. More specifically, the opioid crisis continues to plague families in the United States, with the Centers for Disease Control and Prevention reporting as many as 115 Americans die every day from an opioid overdose. Since 1999, the number of overdose deaths involving opioids, including prescription opioids and heroin has quadrupled. The CDC reported the numbers of opioids prescribed in 2015 was enough for every American to be medicated around the clock for three weeks. Goldfarb’s background is in public health, with specialized training in health care policy research relating to maternal and child health issues. She is particularly interested in understanding the impact of state health and drug policies on maternal and perinatal outcomes. Munn is an expert on aging with particular expertise in gerontological social work research, specifically in the areas of long-term care, interdisciplinary health care teams and end of life care. Millender is a psychiatric nurse practitioner and scientist. Her research interests include stress and the accumulation of trauma throughout an individual’s life that are often expressed through mental illness, substance abuse and chronic disease among minority and underserved populations. Millender works with community-based organizations to study the efficacy of culturally relevant mental health and substance abuse interventions in community and primary care settings to prevent mental disparities. Burdette’s research investigates connections between religious involvement, neighborhood context and health. Her research has examined social variations in health and health behaviors at virtually every stage of the life from birth to old age. Much of her research has paid special attention to disadvantaged populations, including low-income urban mothers. Piekalkiewicz has more than 30 years of experience in public policy, legislative and governmental affairs, disability rights, and substance abuse and mental health public policy development. She has studied the intersection between the criminal justice system and individuals with mental illness and substance use disorders, prescription drug abuse among the elderly, supportive housing, employment and health disparities.